Temporary replacement teeth can be tailored to your specific requirements. The temporary teeth are often designed to be removable but in some circumstances a “fixed” temporary bridge or crown can be made. 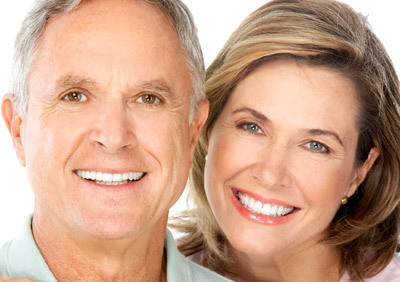 If all of your teeth are missing, we can modify your present complete denture or make you a new temporary denture. Depending on your particular situation, some implants can be placed and “loaded” immediately. This means a temporary or permanent replacement tooth can be placed immediately, or shortly after, the implant is placed. Although it is natural to be concerned about the pain that may be caused by these procedures, most patients do not experience significant post-operative pain. In fact many patients report no post-operative discomfort at all. Pain medication and antibiotics will be prescribed to make your recovery as easy as possible. Rarely, post-operative infections may develop that require additional antibiotic treatment. Although great care is taken to place the implant precisely, adjacent teeth can occasionally be injured in the placement process. In addition, there is a risk that the nerve in the lower jaw, which provides sensation to your lower lip and chin, may be affected. If you are missing quite a lot of bone, it can be challenging and difficult to place an implant without infringing upon the nerve space. Although great care is taken to avoid this nerve, it may become irritated during the procedure, resulting in tingling, numbness or a complete lack of sensation in your lip, chin or tongue. Usually these altered sensations will resolve within a short time, but can be permanent and/or painful. This complication can be managed best if the doctor is notified of tingling or numb sensations within the first week. Although the above mentioned risks are possible, the actual complication rate with implant procedures is very low. Implants usually last a long time. When patients are missing all of their teeth, long-term studies (more than 30 years) show an 80 to 90 percent success rate. For patients missing one or several teeth, recent studies show a success rate of greater than 95 percent. This is an extremely high success rate and compares favorably with other areas in the body that receive implant replacement (such as hips or knees). However, if one of your dental implants either doesn’t heal properly or loosens after a period of time, you may need to have it removed. After the site heals (or on occasion at the time of removal), another implant can be placed. The final replacement teeth are usually attached to the implant after adequate healing has occurred and your jawbone is firmly fused to the implant. Depending on a variety of factors, it may be possible to begin this phase of your treatment immediately or shortly after implant placement. We will review the most appropriate treatment sequence and timing for your particular situation. Your restorative treatment begins with specialized impressions that allow your dentist to produce a replica of your mouth and implants. With this model of your anatomy, abutments (support posts) are created. The abutment posts attach your new crowns (replacement teeth) to your implants. Various types of abutments exist. Sometimes we can use stock (off the shelf) abutments but frequently custom abutments are chosen in order to achieve the most precise outcome. The improved accuracy is usually worth the additional expense of a custom abutment. We will work closely with your restorative dentist to achieve the most cost effective and precise outcome for your particular case. The number of appointments and the amount of time required for each appointment is different for each patient. No two cases are exactly the same. In order to best replicate your original function and esthetics, both the surgical and restorative procedures must be accomplished with great precision and attention to detail. If you are having only a few teeth replaced, as few as three short appointments may be required. Between appointments, the restorative dentist and lab technician will custom make your replacement teeth. The efficiency of this process is improved if you keep all of your scheduled appointments. In general, once your implants are placed, you can expect your tooth replacement treatment to be completed anywhere from 3 to 12 months. As with natural teeth, it is important to clean implant-supported restorations regularly with toothbrushes, floss and any other recommended aids. You should also visit your dentist several times each year for regularly scheduled hygiene and maintenance. As with most dental restorations, implants and their associated components are subject to wear and tear and may eventually require repairs or adjustments. Usually, a dental surgeon places the implant(s) and performs other necessary surgical procedures – your general dentist provides the temporary and permanent replacement teeth. Both doctors will be involved in planning your dental treatment. When multiple doctors are involved in your treatment, you will be charged separately for their services. Before treatment begins, every effort will be made to give you an accurate estimate of all the expenses involved in placing the implants and making your replacement teeth. We will consider any dental insurance that is available to you and will do our best to maximize your benefits. There may be an initial charge for the diagnostic work-up, including study models, x-rays, and the fabrication of a surgical template to ensure the best possible result. In addition, there will be an expense for the abutment or support post(s), the crown(s), dentures, and any other components such as temporary restorations. Periodic maintenance will likely be recommended. Regularly scheduled hygiene and maintenance is imperative to ensure a successful and long-lasting result. Please know that before any treatment is rendered, you will receive an estimate of cost for the proposed treatment plan. In regards to your dental insurance, our goal is to maximize your dental benefits and minimize your out-of-pocket expense. If your specific treatment options are not clear, please contact us. We will be happy to answer any questions you have about your dental care.